It's time for another card challenge! Our challenge this week is a card challenge - create a card featuring either a snowman or snowflake. 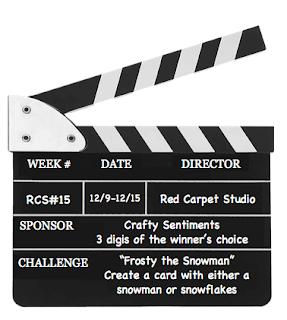 This week's challenge is inspired by the classic Christmas movie, "Frosty the Snowman." 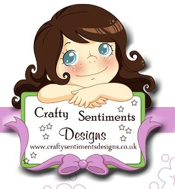 Our fabulous sponsor this week is Crafty Sentiments! 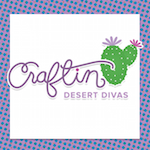 The winner will receive their choice of three digital stamps. Along with the randomly chosen winner of this week's challenge, the card design team will also be taking a look at ALL of the submissions and voting on their top three "spotlight"submissions. The spotlight submissions, along with the random winner, will be announced on Tuesday December 18th and will receive a special badge for their blogs. Here's my first digi card. 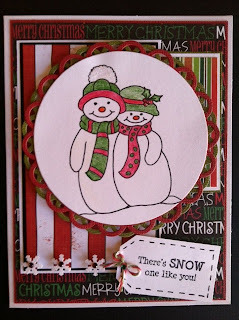 This is an adorable snowcouple image that was provided to us by Crafty Sentiments Designs. 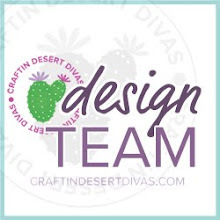 The background papers are from Paper Studio Cardstock and Bo Bunny Mistletoe Collection. I cut out two of the large lacey circles from Spellbinders Nestablities. I thought the sentiment from Cardz TV Snow Day was just perfect for this card! What a great challenge with the holidays here. Super cute and I love all the layering. Such an adorable card - love it:-) Love the papers too! Beautiful card, love the colors and the sentiment! Adorable! I love this sweet image and festive papers. Love the snowman card !!! !